Slow down and yield the right-of-way. Slow down and drive carefully through the intersection. Come to a complete stop, check the traffic, and go when it is safe to do so. A flashing red traffic light means the same thing as a stop sign. You must come to a complete stop, yield to other traffic and pedestrians, and then proceed when it safe to do so. 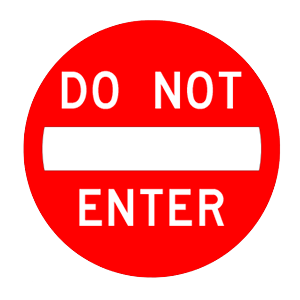 This sign means that it is not safe for drivers to enter the indicated road or driveway from their current direction. 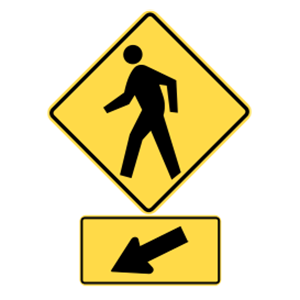 If you come across one of these signs, you should immediately turn around and drive a different way. Every motor vehicle in the state of Oklahoma is required to be covered by liability insurance. Oklahoma law requires every owner and operator of a motor vehicle to maintain motor vehicle liability insurance. Every vehicle you operate must be insured, even if you are not the owner. You cannot cross the line to pass. You may cross the line to pass and change lanes. You may only cross the line to change lanes if you are in the left lane. White lines separate lanes of traffic moving in the same direction. You may cross a dashed white line to pass or change lanes if it is safe to do so.